Trouble usually starts for me with that thought. 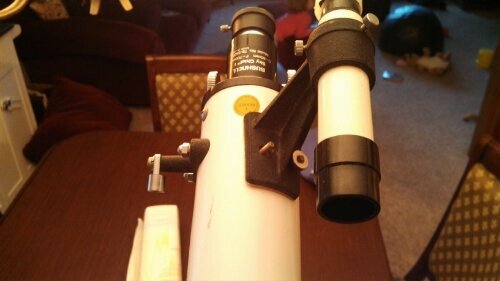 Today, after coming home from the store with my daughter, I saw the old Bushnell Sky Chief 60mm refractor (donated to the observatory by my father, and the scope I first saw Saturn through) looking all forlorn with it’s pathetic little finderscope that was broken (the thing is almost thirty years old…and plastic…and has moved from Delaware to Florida, Texas and Wisconsin). That’s when the flashbulb went off in my mind. I will attach the RA finder to the refractor! So, I broke out the mad scientist laugh (Kylie was amused by that but found the rest of my surgery not nearly as exciting as playing with her plastic farm animals) and got to work. The tools I gathered were: a pair of scissors, a bag of zip ties, and motivation. 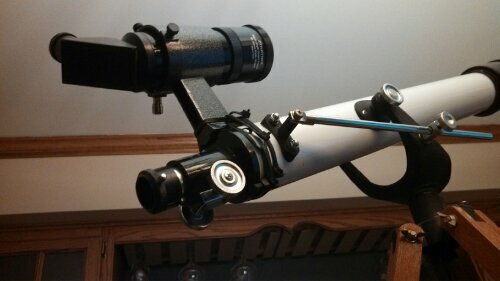 I tried at first to remove the old finderscope base from the Z8 and mount that on the Sky Chief. No joy—the diameter of the two OTAs are waaaay too different. The finder base on the Z8 is nearly flat, while the Sky Chief’s is most decidedly curved. So, I fashioned some straps out of the zip ties by making loops, chaining them all together (the OTA was just a little too big to get one zip tie all the way around and secure the finderscope base as well). I added more on the front and everything was secure and tight—actually it worked a lot better than I imagined. I was impressed by how secure the new finderscope is, side to side. But, I was worried when pointing towards the zenith or in storage (I point it straight up), the finderscope would drop straight down. So utilizing the two screws that are permanently attached to the OTA, I put some zip ties on to hold the finderscope mount stable. Now it’s rock solid in all directions. Is it ridiculous to mount a 50mm finderscope on a 60mm refractor? Probably, yes. Is it cool looking? I think so. Is it practical? Well….I don’t know. 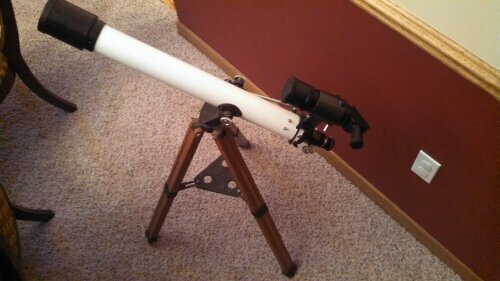 I have to wait for the skies to clear…but it sure will make pointing this thing on target a lot easier!